Vietnam War Ho Chi Minh Trail Game Review - Download and Play Free Version! Immerse yourself in the intense battle fury of the Vietnam War! Fight wave after wave of enemy soldiers! Get ready to literally feel the heat of battle as you assume the role of an American soldier at the height of the Vietnam conflict. 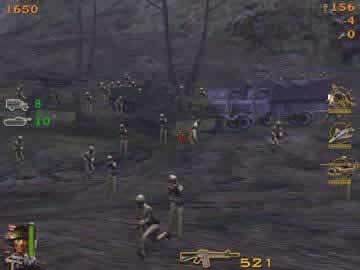 At your disposal are an M16, mortars, minigun, RPG, and a trusty pistol to fight off wave after wave of Vietcong. The odds are hopelessly stacked against you as hundreds of enemy soldiers rush your position. However, you have some handy equalizers at your diposal: artillery and napalm strikes. When the going gets too tough, simply select these special area damage weapons, assign a target, and let it rip. 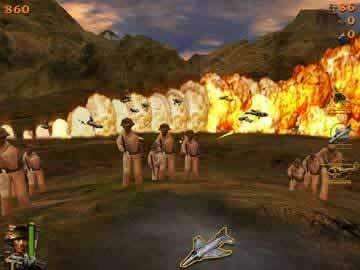 Planes fly in and drop a wave of napalm, just like was seen in the movie "We Were Soldiers", a big inspiration for the game. When you run out of ammo, simply call in a Huey chopper for an ammo dump but be on your guard. If you don't protect the Huey's landing, it could get shot down! Vietnam War: Ho Chi Minh Trail attempts to make your game experience as realistic as possible. Movies and war documentaries were studied intensely for reference in creating this game. Weapon performance, uniforms, environment, and enemy behavior were all researched and replicated in the game. The whiz of bullets, enemy yells, weapon discharges, and napalm drops all bring the intensity of war right to you on your PC. Vietnam War: Ho Chi Minh Trail follows in the trend of old-school arcade-style shooting action where you simply control the crosshairs of a soldier stuck in place as you repel waves of Vietcong. You'll face off against the hoards of enemy units with a variety of formidable weaponry including an M16 which you can zoom in and snipe with, a minigun, a mortar, a rocket-propelled grenade launcher, and a pistol. If things start looking grim, you can also call in impressive artillery and napalm strikes that will decimate enemy forces in a region, plus you can use them as much as you want with just a significant delay after using one. It is quite a thrill to to stop an entire enemy assault with a well placed napalm strike and a few blasts from your mortar, and you'll need every weapon at your disposal if you have any hope of surviving. There is an added element of strategy since there will certainly be times where you'll run low on ammo and the only way to resupply is to call in a friendly Huey which you will have to defend from enemy fire, which is definitely easier said than done, as it unloads the ammo you so desperately need. With 60 action packed missions there is plenty of gameplay to be found as well. There are some slight issues with Vietnam War: HCMT. For starters, since you are simply defending one position and cannot move the terrain doesn't change between missions and the only difference is in slight changes to weather conditions and time of day. The game adds in some different objectives to each level and this helps to keep the action from becoming too repetitive, but doesn't really provide much incentive to play the game through several times. Also, there is no option in selecting the difficulty and it ramps up rather quickly, to the point where you might find yourself seriously struggling to survive by level 10. While this helps to add to the length of the game it can get a bit frustrating at times. Overall, Vietnam War: HCMT provides some decent arcade-style shooting that is intense and quite enjoyable for a time. The array of weapons and their effects are quite satisfying and the powerful artillery and napalm strikes are a site to behold. While there are certainly some issues with the gameplay and the graphics aren't the best, the frenetic battles and sheer quantity of enemies will keep you busy and can distract you from these problems for a time. If the extreme difficulty doesn't wear you down, there are several hours of gameplay to be found with this title. At the very least you should give the demo a try and get a taste of the weaponry and enemies you'll face in this intense shooter.